The US first imposed various sanctions on Iran in 1979 when the US embassy was occupied, with the staff taken hostage, following the fall of US-supported Shah. Oil sanctions were imposed in 2012 ‘to stop Iran from making a nuclear bomb’ even though the CIA had determined that Iran had ceased its bomb-making project in 2003. Some of the sanctions were suspended by then US President Barack Obama following the 2015 Joint Comprehensive Plan of Action (JCPOA/Iran nuclear deal) and Iran began selling oil. On 8 May 2018, incumbent US President Donald Trump walked out of the JCPOA and revived these sanctions, asserting that over time Iran would seek a revised deal and has demanded that Tehran ‘stop’ its ‘destabilising’ policies in the region including ‘support to terrorism’ and its ongoing ballistic missile programme. Trump also wants a ‘regime change’ in Iran. His decision stunned the world (except Israel, Saudi Arabia, and the UAE). Trump has not given any good reason for his decision because there is none. Even given his ‘transactional approach’ to geopolitics, it is difficult to rationally justify the decision. Against this backdrop, it is important to evaluate the broader geopolitical picture and India’s interests before deciding whether New Delhi should continue buying oil from Tehran. Last year, Iran shipped around 777 million barrels of crude oil and 180 million barrels of condensate, averaging 2.62 million barrels a day. If all the importing countries abide by the US’ demand, Iran’s oil exports will stop by November 2018 or even earlier. However, that will not happen. China will continue to purchase oil from Iran. Meanwhile, the EU’s position, despite earlier indications of it’s wanting to stand up to the US, is uncertain. There is an ongoing trade war between the EU and the US. The EU lacks strong political leadership with German Chancellor Angela Markel’s clout weakening and French President Emmanuel Macron not yet able to provide strong leadership. Under these circumstances, the EU might not stand up to Trump. However, if the ongoing trade war between US and EU escalates, EU might take a tougher stand. In short, there is no concerted international move now to stand up to the US as one might have expected in a less irrational world. But, it is reasonably clear that China and Russia will get closer to Iran and derive geopolitical advantage. Looking at the big picture, it is most unlikely that Iran will surrender and ask Trump for another nuclear deal. There can be a ‘regime change’ in Iran, but any new regime would likely take an even tougher position towards the US. While one cannot predict how Iran might react to India’s reducing drastically or stopping of oil imports, it would be useful to recognise that Iran has means to retaliate. One needs to evaluate the pros and cons of buying oil from Iran while also bearing in mind the big picture and Indian national interest, both short and long terms. If India does not ‘fall in line’, the US might punish India by disallowing Indian commercial entities dealing with Iran to enter the US market. If India is the only country that does not ‘fall in line’, New Delhi will find itself in a difficult position with the US focusing all its fury on one country. On the flipside, India will be making a grave error of judgment if it concerns itself only with the availability of oil. Iran, with its population of 82 million, is an ancient civilisation that has been linked to India in many ways over the millennia. 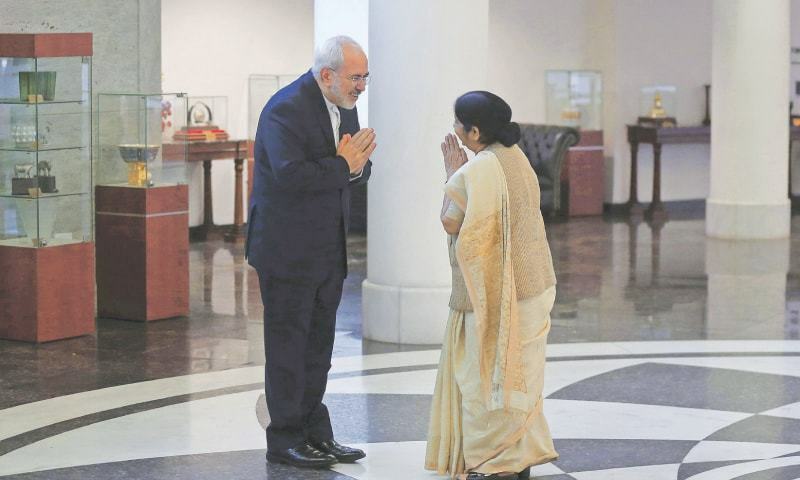 Given the sad state of India-Pakistan relations, Iran alone can provide India access to Afghanistan and Central Asia. India is deeply engaged in the development of the Chabahar Port and associated projects that give India such access. In 2017, India exported wheat to Afghanistan through Chabahar. That port development project is part of a much larger North-South Transport Corridor. If India stops oil imports, Iran might respond by stalling India’s participation in the Chabahar Port project. China has control over the neighbouring Gwadar Port in Pakistan—a matter of some geopolitical concern to India. Moreover, India’s claim to be a great power will be questioned if it meekly accepts the US’ demand. After all, a great power is one that behaves as a great power. What will Trump do if India continues to import oil from Iran through companies created solely for that purpose and hence not need access to the US market? In the past, India had a reasonably successful Rupee-Riyal arrangement. Moreover, if India complies in the case of Iran, the US’ pressure on New Delhi to stop buying the S-400 missile system from Russia will only increase as the US will invoke its Countering America’s Adversaries through Sanctions (CAATSA). Assuming India’s various ministries and agencies with the Ministry of External Affairs as coordinator have already conducted a holistic study of the pros and cons, the task at hand (in either scenario) for India should be: if the conclusion is to ‘fall in line’, India should see what it can get in return from the US. If the conclusion is to defy the US, then it will be necessary to come out with a statement to that effect by the joint secretary responsible for MEA’s External Publicity & Public Diplomacy (XPD) Division. The latest signalling from Washington is that India can expect ‘waivers’ provided it progressively reduces imports from Iran. In diplomacy, it is almost always important to make one’s position clear as early as possible. Trump is basically transactional and will think twice before punishing one of the biggest buyers of arms from the US. Diplomacy is the art of dancing with more than one partner at a time. Meek surrender or appearance thereof is not part of mature diplomacy.